12/3: Rock Wall Wine Wonderland, Ventura Winter Wine Walk; 12/4 Cave Bubbles! Next weekend winter wine wonders abound! If you’re in southern California, the first weekend in December is a good one to come to Ventura County for a wine and art adventure! Bay Area folks should buy tickets now to the Wine Wonderland at Rock Wall Winery in Alameda. OJAI CA: If you’re an Ojai Vineyards Wine Club member, get started on Friday afternoon Dec. 3. From 2-6pm members can pick up their club shipment and enjoy an exclusive tasting event at the tasting room 109 S. Montgomery Street near the Ojai Arts Center. Ojai staff including winemakers and cellar rats will be on hand to answer questions and pour two special wines in addition to the regular tasting menu. This event will repeat Sunday December 11th from 2 to 6 pm. Please RSVP Tel. (805) 649 1674. Here’s Ojai’s Home page where you can Buy Their Wines. VENTURA CA: FIRST FRIDAY Then head to Ventura where you can roam the streets during the monthly First Friday and check out the art. You might even join a SantaCon on bikes–meet at 530p on your bike in your Santa Suit at the Artists Union Gallery where California Street hits the sea; ride leaves about 6pm. Bring your own wine glass! VENTURA: HOLIDAY STREET FAIR Saturday’s street fair starts at 11am. During this popular event, downtown Main Street is filled with vendors and music. VENTURA: WINTER WINE WALK Saturday night at 6pm Ventura will light its holiday tree by the San Buenaventura Mission and celebrate with the second Ventura Winter Wine Walk. Holiday festivities include caroling by local church groups, Santa Claus ride into Downtown Ventura on a fire engine, and snow falling from about 645-8pm! The event is free and open to the public. For more information, call 805.641.1090 or visit www.downtownventura.com. Participants in the self-guided Winter Wine Walk from 4-8pm can sample fine wines and delicious appetizers: $42 gets 12 sample tickets. Learn more www.venturawinterwinewalk.com or by calling (805) 765-4294. NOTE: You have to check in before 6:30pm. I was downtown last year for the Ventura Winter Wine Walk; you can read my impressions of it here. While I was personally disappointed in it overall, I am willing to give it another try this year. Unless you like tasting wine in a plastic cup, I strongly recommend that you bring your own wine glasses to the Ventura Winter Wine Walk. Reidel has a fabulous stemless glass in a round cardboard carton or go for GOVINO–ergonomic, well shaped, high quality plastic wine glasses. You can buy them at Palermo the night of the event–$3 for one or $13 for 4. Next year event organizers should give people event branded govino glasses. 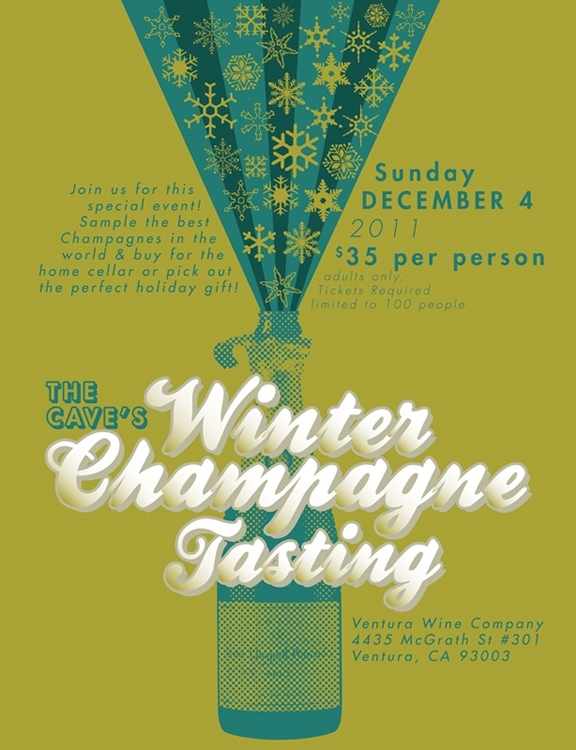 VENTURA CA: CAVE CHAMPAGNE TASTING On Sunday 12/4, from 1-4pm, for $35, 100 lucky people will taste various kinds of Champagne in the Cave in Ventura. The retail store will be open from 12-5pm and you may come in to purchase Champagne and any other wines during that time and enjoy special reduced prices even if you are not attending the Champagne Tasting!!! 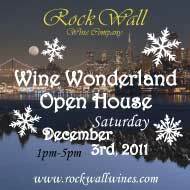 ALAMEDA CA: ROCK WALL WINE WONDERLAND If you’re in the Bay Area the first weekend in December, you’ll want to head to Rock Wall Wine Company for the Wine Wonderland Open House Saturday December 3rd , 2011 1:00-5:00pm. The entire Rock Wall Wine Company portfolio will be available to taste, including 7 new releases. I had a chance to meet the head of Rock Wall, Kent Rosenblum (yes THAT Rosenblum!) and his winemaker, daughter Shauna, at the PS I Love You Symposium July 2011. I look forward to writing more about them–as I learned sitting with them at lunch, they have a beautiful story and excellent wines! This event also features a variety of wonderful selections from the very talented resident producers: Blacksmith Cellars, Carica Wines, Ehrenberg Cellars, John Robert Eppler Wines, Joseph Gary Cellars, Mercy and R&B Cellars–over 65 wines to taste! In addition to the wine tasting, admission includes tasty bites, sweet treats, tours, live music and plenty of holiday cheer! The party goes from 1:00 to 5:00 pm and tickets are $30 per person through the Rock Wall tasting room, $35 per person presale online and $45 per person at the door the day of the event. This event is only open to those over 21 years of age. Age will be verified at admissions. For ticket and/or more information go to www.rockwallwines.com. ← Holiday Wine Challenge Part 3: Ham & Zin!